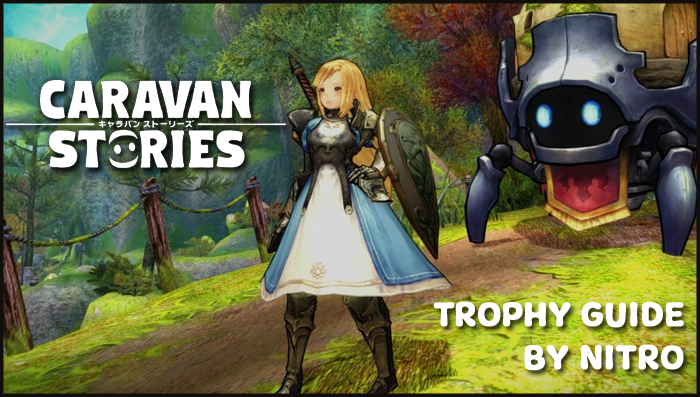 Caravan Stories is A Free-To-Play RPG that is currently available exclusively to the Japanese storefront. It has a very easy 100% which should not take you over an hour. This is a similar style game to Pokemon where you can capture creatures and allow them to fight with you but you won't be exploring the mecanic much. -Always use the Auto-Run feature. This will run your character to the required location or next load screen. It makes this 100% so easy. -If you do want to stop the Auto-Run for whatever reason (like picking up a material/XP boost from the floor), just move either: or and it will cancel the auto-run. After clearing the Shrine and getting your Caravan, a few cutscenes will play and eventually you will be thrown back to your village. Go over to your quests by pressing and scroll down to "Register Fholka Village". Auto-run there and you will be bought to a Caravan Post, walk up to it and you will unlock the trophy. You will get this trophy after exiting your village for the first time on your way to find Jade. Before you enter your first encounter, Lena will mention that you can turn the Rattie into an Ally. After you defeat the Rattie, you will unlock this trophy. This will come naturally. After your tenth battle, regardless of enemy type, this will unlock. During the game you will get materials and these materials can be used to craft different things. To geg this trophy however, we only need 10 materials which is very easy to get. In the forest the game starts you in, you will run over 6 or 7 materials whilst your character is auto-running, there is also 1 material which is near the end of the first forest to your right which you won't automatically run over. The next place where you will get the rest of you materials is in your village by completing a quest from Pando. His quest should appear after Researcher has popped (it will be the second one, if not, complete another quest first). After Speaking to Pando for the first time you will automatically complete his quest. Press and press . From there, claim all the rewards and you will receive this trophy. Having said all this, you should be able to get this naturally over the course of the game. This trophy too is a bit misleading in terms of why it unlocks. Originally it was thought to be glitched in a good way but it turns out the game counts your two friends who battle alongside from the very beginning of the game (Mage and Healer) as as heroes as well. So to unlock this trophy we will only have to become allies with one additional character (for a grand total of 3) during the story. The character we will be becoming allies with is called Alotie, she is a fortune telling bunny. To trigger her quest, we will need to follow the main story line until we get to a guard who won't let us pass because of a threat behind him. Finish this 3 wave boss battle (you may have to use XP boosts you can find on the floor or from doing other quests) and he will allow you to proceed. This trophy is a bit misleading, to get this you won't have to clear 10 TYPES of quests, you just have to clear 10 quests. This will unlock near the start of the game. After you get back to your village and defeat the monster, you will be given some quests to complete before going to the shrine. Just continue picking the top quest and have your character auto-run to it. That's a nice one. Thx Nitro. However, just a random thought: any rumors of having DLCs in the future? That's interesting... I know that NNK2 has DLCs, but... hard ones they are? (Yoda mode on ). The game is based off a mobile port that was released in Japan in 2017 , the mobile port has cross play with PC players. The mobile version has had a few events in Japan so depending on how well the game goes on consoles it very well may have DLC at some point.